These two outdoor designs of all the many wonderful designs by Horticulturalist and Landscape Designer, Jamie Durie were the ones that caught my attention. I really love the blending of different textures and the simplicity of the design. I love how the crushed quarts and boulders were combined to make a drama effect. The use of wooden flooring made the entire design of the outdoor garden unique and easy to maintain. I never realized that woods can be substituted to bermudagrass for your lawn. I was just only thinking that it would be nice if it would be a covered lawn to increase the life span of the wooden floor. 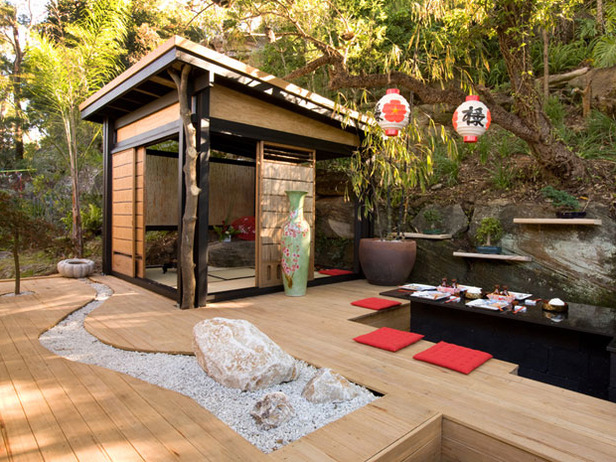 The presence of a tatami room in this Japanese outdoor garden is really nice and inviting. The sunken dining area makes it even more unique and appealing. It was so simple yet so classy! The idea of putting up a stand alone fire place made up of rocks and stones made this outdoor garden truly exceptional. The built in bench in an irregular shape adorned with colorful throw pillows complement the entire set up. Very simple but very elegant! Sobrang gusto ko yung Japanese inspired outdoors using woods kaso lang nga kasi sa Philippines always may bagyo kaya yung life span ng woods ang problema. Okay siguro kung covered yung outdoor space. Hi KM! Alam mo ba na isa yan sa dreams ko, yung magkarun ako ng mini spa sa house? Hahaha!! Ang ganda ng Japanese inspired designs ano? Parang may kakaibang touch. Hehehe. Tsaka mahilig sila gumamit ng woods sa mga designs nila. I love everything ang ganda!Wish ko lang may gnayan din kami sa bahay! OO nga Sis! Ako din...I will make one like that in my house one day. I really love Japanese designs. Hi Aileen! Ywah, that's one thing good about minimalist designs, as you said less clutter, more space. So maginhawa ang pakiramdam. :) Sa Feng Shui, good din yan coz it can attract positive chi.